Webydo and Parallax for You. Parallax scrolling has been making waves for a couple of years in the interactive design community. Even if you don’t build interactive content, websites, or mobile apps you have probably come in contact with a parallax scrolling site or application. Building this kind of interactive experience has real pay-off with extended audience engagement, but unless you have a really solid team of coders, it can also be a daunting task. 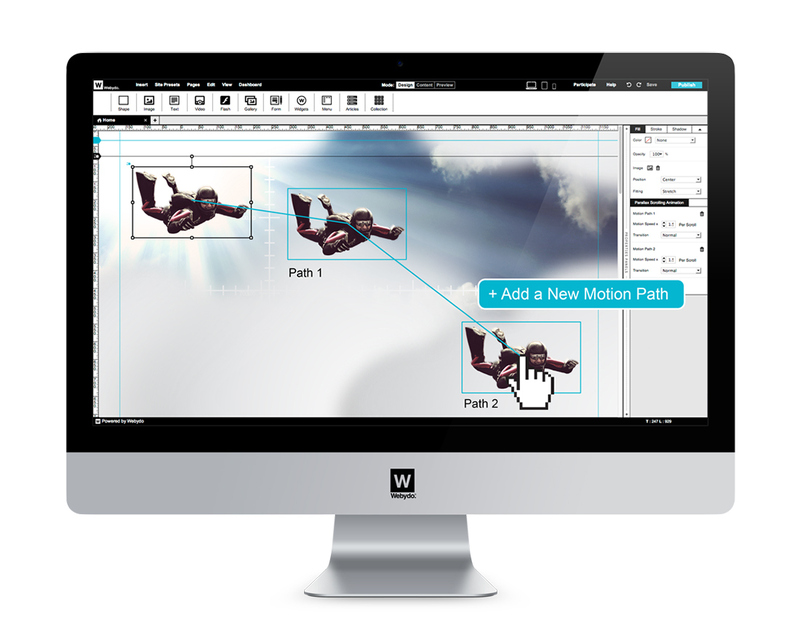 This is where Webydo steps in with its new Parallax Scrolling Animator software that is currently in a closed beta. The link above will take you to the site where you can sign up to join the beta test and help shape the final outcome of this code-free design tool. Now, before you say the whole parallax thing has jumped the shark, think again. It’s here to stay. I agree that the problem with it is, that it has been overused as the hot new look, and more often than not it has been done badly. I also agree that there are issues with speed, mobile implementation, and SEO, but it isn’t going away, so Webydo might make your life a bit easier, and your results a lot better. As Zack Rutherford points out in UX Magazine. Paralax has a certain wow factor and gives designers an opportunity to push interactive design in some exciting directions if done right. With Webydo making parallax available to its users there is hopefully a chance for less bad parallax, and more well designed rich interactivity..
Posted in Design and Art, Technology and tagged CSS, Design, HTML 5, Interactive Design, Java Script, Parallax, Parallax Animation, Technology, web design, Webydo on July 16, 2014 by Author.